I seem to be doing something fundamentally wrong on pond5. I've had some video sales but NEVER an image sale, never, not even once. My stuff sells well on SS, iStock, Fotolia and even 123rf. What am i doing wrong on Pond5? Image sales are rare. I'm a vector contributor and I have had a handful of vector sales, but nothing to write home about. Videos are doing much better. I can't say what you're doing wrong. If you have sales on other agencies, it might just not be the type of pictures the Pond5 buyers are looking for. My last sale was on 6 April... So.. I'm used to it. I have about 3200 images there and am lucky if I sell 5 in a month. What am i doing wrong on Pond5? People don't go to Pond5 to buy images, they go there to buy footage and music. Images is just something they added there but those customers are used to Shutterstock and the others. Don't bother uploading images! Look at their home page...ONLY VIDEO advertised! "Find inspiration by searching the largest library of royalty-free HD and 4k stock video"
We are sorry to hear this. First off, we would like to thank you for being a contributor with us. We would like to also provide you with some nuggets of knowledge, regarding helping raise your exposure and ultimately, your revenues on our site. If you have more high-quality media, definitely continue uploading more of your work. Our customers know what's good, and the larger your high-quality collection, the more recognition you can have with our community. Buyers are always hungry for amazing content! For your clips to be easily found, accurate rich info in titles, descriptions and keywords are helpful. How you title and keyword your work isvery important. If you spam your keywords or titles, it will only hurt your visibility. So doing this in more detail, butACCURATELY has a significant 60% SEO weight on the search results. We also, always recommend that you promote your work, to up your exposure. You can create a Collection bin showcasing your footage, and then simply copy the link, to add that to your website or social outlet. Here is a link to our Knowledge Base article explaining this: What are Collections? Another option, is just to simply post links of your clips and distribute all over the internet. You can even add some of your clips to our "free clip promotion", for this will also help get your name out there. Next, you are welcome to explore through our Artist Resources page. Here you will find tons of very valuable metric information, such as what kinds of files comprise what percentage of the sites sales, the most commonly searched key words, and so much more information that we think are useful for our artists. Lastly, if you use your Referral Links, you can even make 5% on all purchases or sales made for the first year of people who sign up using the links you give them. That's another way of thanking you, for sharing Pond5 with your friends! We hope this helps. Please let us know if you have anymore questions. That being said, every week there are a number images being sold for $500+, but that's like winning the lottery I suppose. The message that it's almost exclusively clips they're interested in is clear from their reply. There are many, many, many authors meeting $100 every month on Pond5, believe me. $5,000+ is not that uncommon. Yes, you most likely need 500+ video clips or quality music for that though. They sell footage for millions each month but of course, there are quite a few clips so if you're new with a small portfolio it's hard to be seen. Sales create more sales and new stuff isn't too visible in the search engine. But after a few years when you have high ranking stuff the sales can really roll in. It takes time. 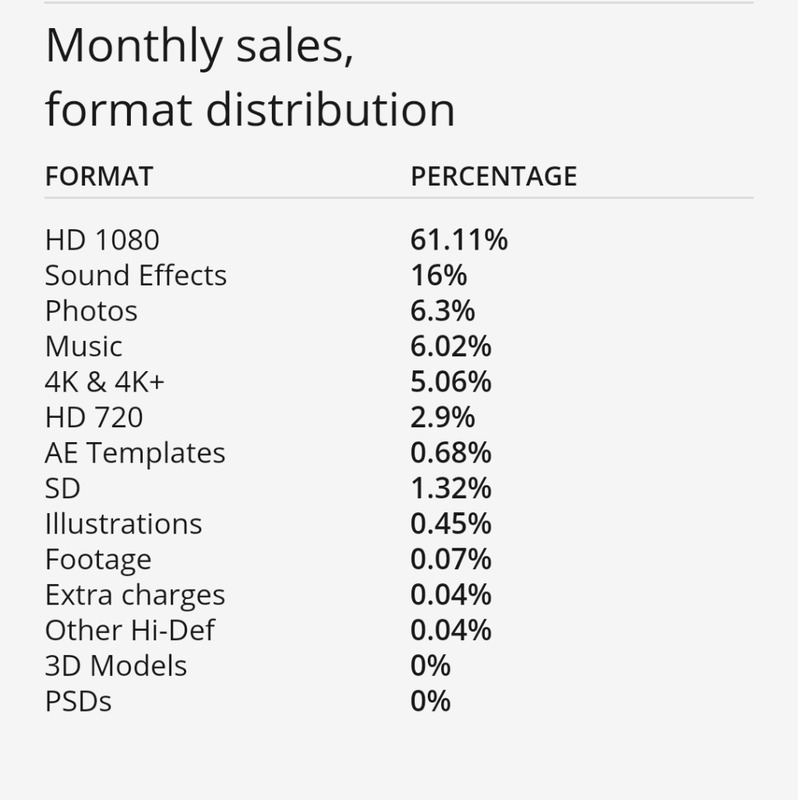 What is the difference between 'footage (0.07%)' and the other video (1080p/720p/4K) categories? Of course. 15 is nothing. 500 is minimum to see any action at all even if you have good clips. Just get to work. My best sales are on Pond5, but I sell stock footage and stock music, so I really don't think people go to Pond5 that often for images compared to 123rf, dreamstime, fotolia, etc. I realize that, its just amazingly hard to edit and upload video. The workflow for images is much more sorted. That's why you can still charge hundreds of dollars per clip and there are still a few good years in the footage business left. It's good that it's hard. Just use After Effects or Final Cut. The workflow is not more sorted for images, it's just that video takes more time and involves more data. For one person getting 500 clips up in two months from scratch is not an impossible task at all. But of course, you have to treat it like any other job and spend the hours. 14 photo sales in October so far on Pond5 with just over 1000 in my port. b) your images are not commercial. these two reasons are in my opinion main reasons for low traffic of your images.  wow, that is one huge portfolio. Can you please tell me how much you got from video sales at Pond5 per month? and is it really possoble to get 5000$ per month for video sales at Pond5?? Yes, absolutely. I would say that Axiomimages, Blendimages, Hotelfoxtrot, Wavebreakmedia, Rickray, Skyworksrf etc. all make around $10,000-30,000 per month from Pond5 alone. Naturally, most authors will make much less, but there is great potential. This motivate me so much. great, I saw his work today and its amazing and been used by many movies. I believe their earning must be in 6 figures. Why not? A well-made track can be used for so many different things. Footage is way more specific and a single clip will never get as many sales as a single music track can get. You are 100% right, but as a musician and also an amateur composer I never thought there was a such large market. Anyway I'm glad of it because it takes longer to prepare a good track than most good pictures, and sometimes even than some footage, so it's nice to see that this work is rewarded. A good stock music track is worth a thousand pictures. I came across this thread. I am very new to stock images/footage. This thread was insightful about Pond5. It looks like your portfolio has grown. Have you seen improvement in sales? I'm very new to stock footage/images and have a lot to learn, both about the business, and improving the quality of my work. I like your math of 10 clips a day, and do see this as doable, timewise. My current issue is figuring out subjects and items to shoot. Not sure I can come up with 10 ideas a day, or even near that. Any suggestions on getting the ideas flowing? At Pond5, I've made an average of $600 per month this year. So still a long way off $10 to $30K, but it's reasonable! Photos rarely sell on Pond5. So, you are not alone. at this point, I'd be very happy with that, considering I'm just getting started. Do you mind me asking how many items you have on there? (footage, sound, images, etc) or share portfolio if you want. In the same period (~1 year) and same videos I sold one video at Poond5, 10 at SS, and 3 at Fotolia. I have about 40 videos. So for me, pond5 isn't best for videos. For me the pond5 is my third site after the SS and Getty. For photographs forget, seeing very little there. When I uploaded videos in Videoblocks, I thought I'd lose a lot on Pond5. On the contrary, luckily or not, my last 6 months are excellent there. Well, Pond5 is a very, very hard place for newcomers to generate sales at. It is the first site contributors send their clips to, and I read that they get around 10,000 new clips sent in per DAY! It is not strange that it's almost impossible to be found. While I have more than 150 video sales from all sites combined this month so far, only a handful of them come from Pond5. The competition there is just too great and I started submitting too late. The guys who started 10 years ago are still seeing the benefits of getting those early sales and ranking high in the search engine. I have clips on SS, iS, FT/AS and P5. I sell only on SS and iS. I hope on FT/AS things will be different but.. Nope, no sale as well on FT/As..
Hi, if you have a 500 portfolio that's just pictures, would you expect a sale in pond5? Bad Behavior has blocked 61664 access attempts in the last 7 days.